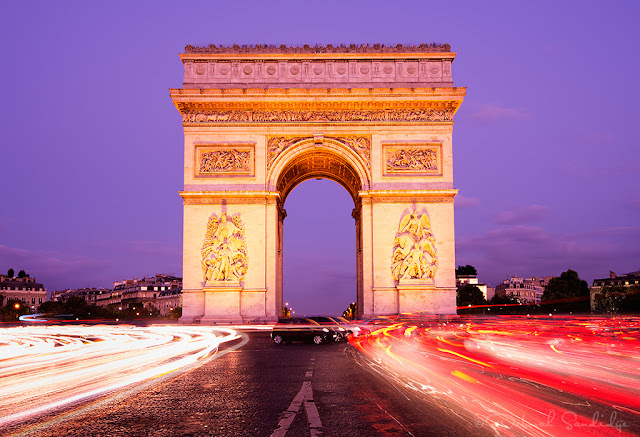 15 seconds of rush hour around the Arc de Triomphe on Champs-Elysees in Paris, this is the busiest and craziest place for traffic at most any time of day! The photo above was taken during twilight, which provides the most balanced and colorful light for an evening composition. A Nikon D4, Nikon 16mm-35mm lens, Feisol 3442 tripod, and a remote release were used to capture the passing cars as streaks of light. You can use a variable neutral density filter to extend exposure time such as a Singh-Ray Vari-N-Duo or better yet, the Vari-N-Trio, which has a neutral density filter, polarizer and a color enhancer built in. If you want to learn more about how to create photos like the one above, join me for my online course, Long Exposure Creativity! If you are near the Niagra Falls area in March, I'll be giving seminars on long exposure, and also on infrared photography at the Niagara Frontier Regional Camera Clubs Convention. I hope to see you there! The time lapse below was made just for fun so give you an idea of what it's like to drive around the Arc de Triomphe! Enjoy!